Breakfast, brunch or Belgium! Waffles are a party anytime and any where. Cover them in ice cream, frosting, chocolate, candy, fruits and sprinkles of sugar and order yourself a glass full of chocolate milk! 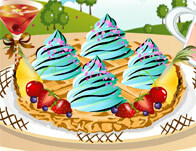 Waffles are a colorfully sweet adventure!